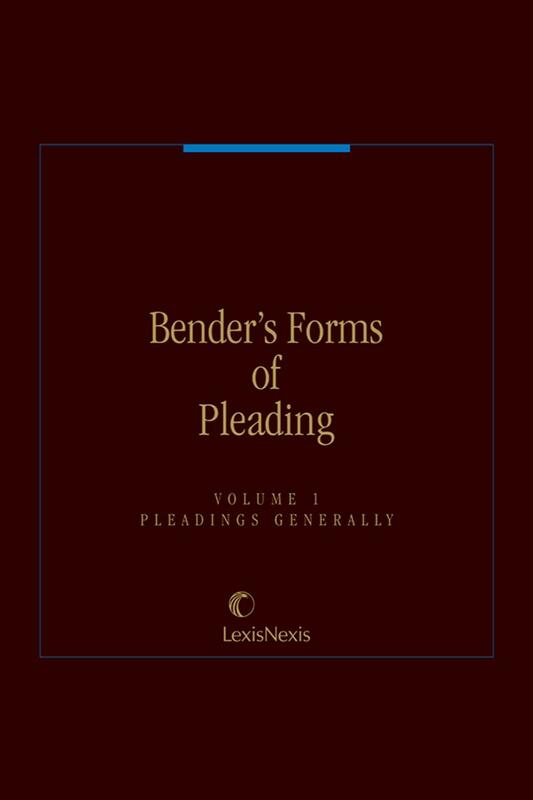 Bender's Forms of Pleading provides users with many time saving sample complaints for different types of cases, including negligence cases, other types of torts, contract actions, statutory and equity complaints, defenses to these types of actions and checklist type drafting tips. 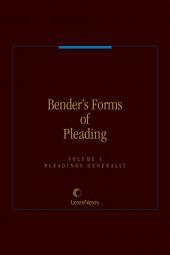 Each chapter of Bender's Forms of Pleading contains a concise statement of the substantive law necessary to prepare a proper pleading.  Discussion is provided for each cause of action, before the pertinent forms. Illustrative forms include: complaints, defense pleadings, bills of particulars, counterclaims, third-party complaints and petitions for torts, negligence, contract actions, statutory actions, special proceedings such as Article 78, equity proceedings and Surrogate's Court proceedings in New York State. 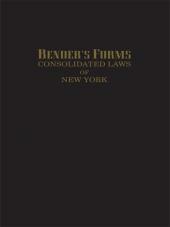 Ample cross-references to New York Civil Practice: CPLR (Weinstein, Korn and Miller), Warren's Negligence in the New York Courts, and Bender's Forms for the Consolidated Laws of New York saves time for those looking for more in-depth discussion, and related forms, valuable research time. Bender's Forms of Pleading is updated three times a year with appropriate new chapters, the latest legislative amendments and new forms based on the most up-to-date court-tested pleadings. Also available on New York Law and Practice Library CD-ROM.